Flux-Cored Solder Wire | Nihon Superior Co., Ltd. 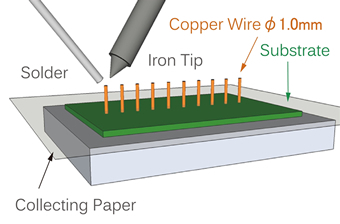 The flux-cored solder wire enables fast soldering with less carbonizing of soldering tips and less flux spatter providing greater productivity than existing products. SN100C (031) is a general purpose flux-cored lead-free solder wire that offers improved productivity. The alloy and cored flux combination provides excellent wetting for components with poor solderability.solder wire provides fast wetting, resulting in faster soldering. Solder each wire with a tip temperature of 280℃ to 380℃. Count the number of spattered flux droplets around each soldered wire. 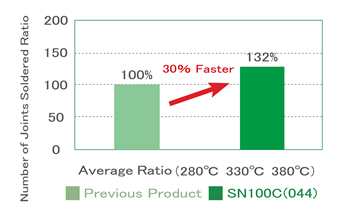 The fast wetting and spread of SN100C (044) flux-cored solder wire makes it possible to complete a solder joint up to 30% faster than with previously available completely halogen-free flux-cored wire. Excellent wetting and spread ensure high first pass yields. Completely halogen-free. Does not contain F, Cl, Br or I. 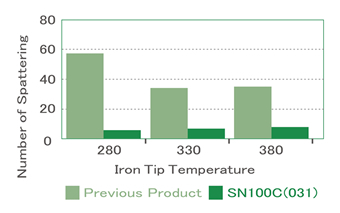 With sustained activity and good separation of the solder from the tip with a consequent reduced incidence of icicles, high reliability SN100C (551CT) is Ideal for sequential soldering and rework.